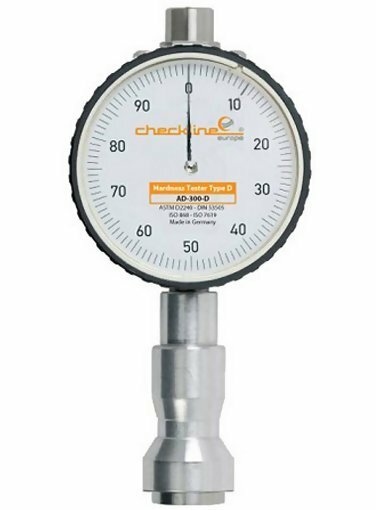 The Checkline AD-300 precision durometer is designed to measure the hardness of vulcanized or thermoplastic rubbers, elastomeric or soft plastic materials and silicon products via indentation resistance. The AD-300 durometer meets the requirements of most international standards, including: DIN 53505 (A, D), ISO 868 (A, D), ISO 7619 (A, AO, D), ASTM D 2240 (A, D, C, O). The Checkline AD-300 is German-engineering with the highest build employing an ultra-low friction movement and an indentor machined to the highest standards. Together with the ergonomic enlarged foot this enables you to take highly accurate and repeatable measurements.